Negative publicity and, some would say, biased media coverage of police departments across the country, impacts how they are perceived by the communities in which they serve. In the age of Facebook, YouTube, and other social media platforms, there seems to be no shortage of stories depicting police officers in a negative light. But there are thousands of additional stories out there reflecting police in a positive manner which never see the light of day. The interactions I’ve had with my local police department in Temecula, California have been limited. I’ve never had any type of emergency where I felt the need to dial 911. This is a good thing! I have however, called the non-emergency number to report suspicious activity from time to time. 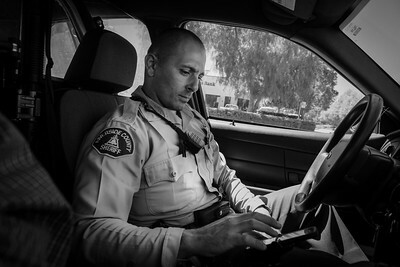 In these non-emergency situations, I’ve been treated efficiently and respectfully by the responding officer whether it be a member of the Temecula Police Department or the Riverside Sheriffs Department, which contracts with the city of Temecula. As a documentary photographer, I’m used to focusing my camera on global social issues impacting third world countries. After being inundated by the negative media coverage regarding police departments across the country, I wanted to put my hometown police department in front of the camera for a couple of weeks and try to show the citizens of this community a small slice of the work that is done by these men and women that wear the Temecula Police Department and/or the Riverside County Sheriff Department uniform each day. The police have a difficult job keeping the city of Temecula within the ranks of Americas safest cities. They deserve appreciation for this. These pictures were captured during a series of ride-alongs, walk-alongs, and a day in the field with the P.O.P team. 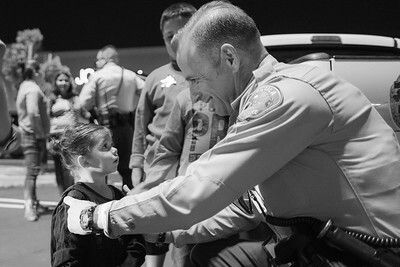 A deputy at the Promenade Mall comforts a child by giving her a deputy star sticker. 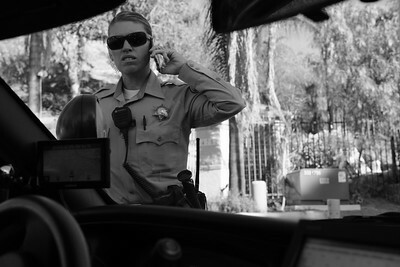 A deputy keys in a GPS location for the next call. 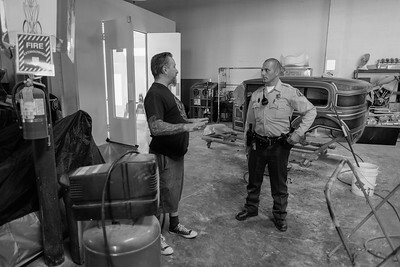 A deputy, having responded to a silent burger alarm, speaks with the owner of the shop. The shopkeeper operates a custom auto body painting and detailing shop. 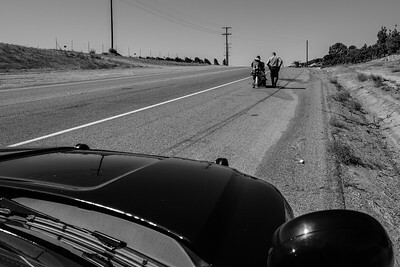 A deputy asks a woman wandering down the highway on foot if she is in need of assistance or any services offered by the city of Temecula. The woman declined the deputy's offer of assistance. 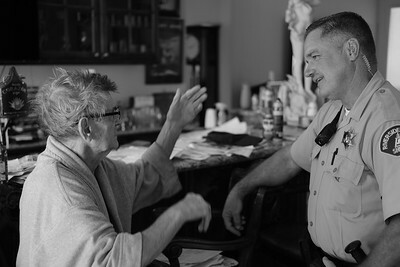 A deputy, conducting a welfare check, speaks with a elderly homeowner. 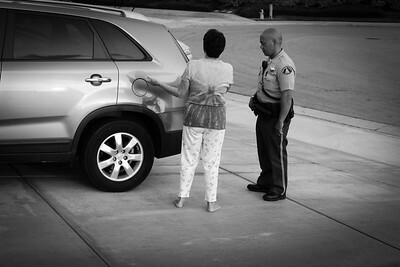 A Temecula homeowner speaks with a deputy regarding suspicious persons in her neighborhood. 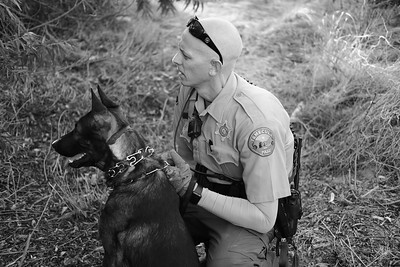 A deputy and his K-9 partner [Boris] search a wash basin for a suspect. 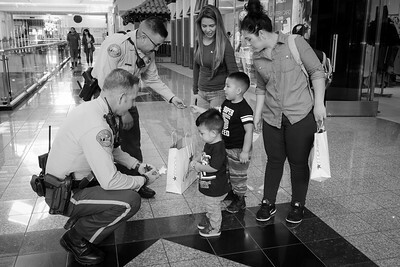 Two deputy's on patrol in the Promenade Mall, give badge stickers to two young shoppers. 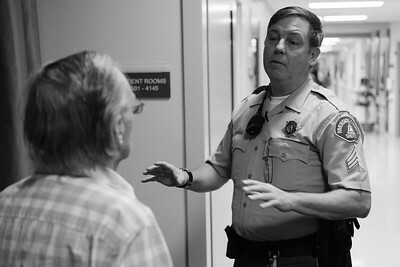 A sergeant speaks with the father of a patient at the Temecula Valley Hospital. A deputy returns the call of a citizen who telephoned the non-emergency number seeking information only. A visit was not required. 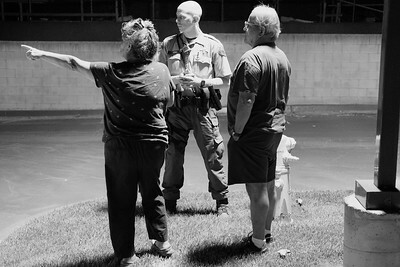 A deputy speaks with two residents of a apartment complex who called in a noise disturbance from the adjacent building. 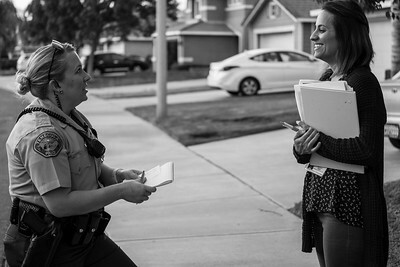 A deputy speaks with a child welfare case worker after accompanying her to check on the welfare of a child.